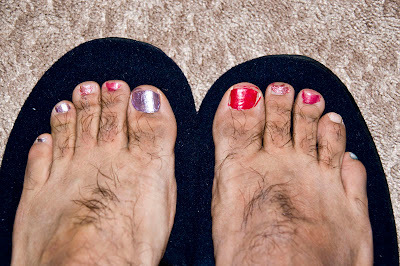 My kids had a blast painting my toes nails last weekend. When you have daughters, a Daddy has to do what a Daddy has to do! By the way, my toe nails are still nail polished after a week! Oh well, who cares! Way to go Dad!! Love the colors. Ever think of shaving those things? They might look good behind all that brush!